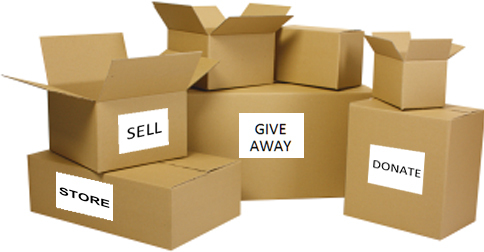 Use proper packing containers- you do not want to find your belonging damaged during the move. Ask for help- call a professional if you need to know how to pack something and ask friends and family to help with the packing if you are not having a professional team come in to do the packing. Don’t over pack your boxes. When they get to the new home you want to be able to handle them if needed. Label cartons- if possible by what rooms they will be going into. At the very least label what is in the carton. What gets sold or donated. – Plan a yard sale, take pieces to a consignment shop, pass on to a friend or a family member or donate at Salvation Army or church bazaar, etc. What goes into the trash. Preparation – Have a layout of where you want the furniture to go in your new home. Check hallways and stairways- Will furniture fit? Your mover will want to know about any of these conditions. proper preparation is key to a trouble free move. Communication- Make sure your mover has all the necessary information. Make sure they have all the information about the new location. Make sure your mover is clear about everything that needs to be moved. Let your mover know about an concerns you might have. New flooring, items that require extra care, etc. There are certain items movers should not move. Make other arrangements for moving these items. You should get the list from the mover that you are using. Have the refrigerator and freezer empty before the movers arrive. Check the entire house before the movers leave to ensure nothing is left behind. Plants should always be dry. Select the right mover for you and your belongings. Shop around. Interview a few if needed. Get recommendations if possible. All these considerations will help to eliminate the unnecessary stress during the move. Welcome home.